Joey deVilla: "Looking at a 'Gang Signs' chart, I asked myself 'Why should gangstas have all the fun?'" - This is super funny. At work we had a project with the codename K2. The K2 team had their swagger, all in fun, and created their own gang sign. 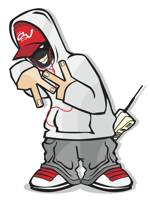 They even got one of our graphic designers to create them a logo with a gangsta flashing their gang sign. So, I convinced the designer to create one for the Audio-Visual team and we had our own little gang war going on. Complete with tagging of other teams territory. It was fun while it lasted. Our Recorder team is full of guys that live for Vi, don't ask, and they had their own little gang sign. Basically you make a fist, form the peace sign, that gives you the "V", then extend your pinky finger for the "i", there you have it "Vi."